Time spent in mobile apps dominates, mobile web. Well, both iOS and Android are popular mobile operating systems around the globe. And it’s difficult to conclude which one is better. This factor entirely depends on each user and his/her necessities. Of course, there might be fans as well as haters among user. 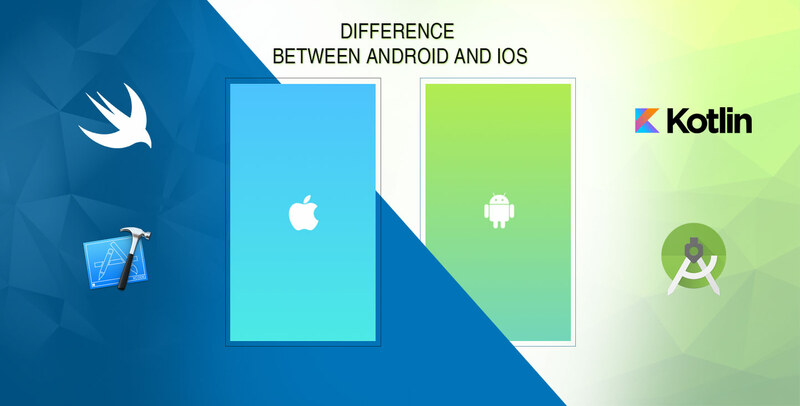 In this blog, let’s find out the major difference between iOS and Android mobile application development? The poll conducted by Hunch.com, reveals that iOS users are more likely to be early adopters. More often we end up with the conclusion the users are loyal to Apple, (more than 100% more likely to own a Mac computer when compared to Android users). The Android users seem to be late adopters. The users prefer a full-featured device that does not exceed the price of its appearance. As far mailing option is concerned, they prefer to use Yahoo Mail instead of email domain associated with work or their website. The next big factor that creates a huge difference between Android and iOS development is the programming language. It plays a crucial role in obtaining the desired product. For Android app, the most common language used is Java, another language that was adopted was C++ for which helped to improve the native experience. Kotlin-a recently introduced Android language is now it’s official. Whereas iOS programming involves Objective – C. Apple introduced Swift in 2014 as the official language for iOS apps. It is simple to learn its syntax. The top advantage of this language is to help developers to build mobile apps that run on Apple devices. Earlier, Eclipse was the environment used for Android development. However, with the launch of Android Studio created by Google, Android developers use Android Studio for app development. For iOS apps, the developers have XCode (Xcode 9 ), to accelerate the development process and depending upon the programming language, you can choose the development tool to create the wanted application. For instance; in case you opt Java, XCode is an ideal option. And for Swift, Android Studio is a great choice. The developers can initiation mobile development for free, with free tools and free documentation provided by both the Apple and Google. Moreover, the coding process also does not require any cost. The difference appears at the time, the developers uploads the apps in the market. For instance;- For iOS apps you will need to pay $100 per year with higher prices for enterprises, but for Google Play Store it is a one-time fee of $25. It's important to consider the budget because it will depend on the amount of ROI from your app. Designing is one of the top difference between that lies between iOS and Android. The unique design in iOS attributes a clear aspect in the app, making users and developers loyal to the brand. Whereas, in Google directs rules for the simplest design. With Material Design, the developers can go to avail the pleasant effect of paper and ink. At Root Info Solutions, we understand the what is most suited for our client's business and accordingly recommend the solution analyzing their resources. In this post, we have offered some guidelines that help you to make the better understanding of each platform. NEXT POST Why Drupal Commerce for your online store?